I once had a discussion with a friend about the trouble with ventures such as ebook publishing or YouTube posting. He’s a talented filmmaker and lives off of his skills, primarily shooting commercials for major firms in town and recently beyond. But he expressed frustration that his own YouTube channel, devoted to his creative projects, isn’t doing better. I understand his frustration. It’s one shared by authors too. You put so much sweat and so many tears into your work, mostly to crickets at first. What I told him is that I think book publishing and video publishing are the same. Part of the formula is sticking with it long enough to get the engine started. Every promo, every bump, is like pulling the lawnmower cord. Many pulls at first seem to get the engine revving, as if it’s about to spur to life, only to have it peter out. Eventually, with enough pulls, the engine roars to life and sustains. So it’s with this in mind that I once again pulled the cord. Last week, I set up a BargainBooksy ad (I’ve had pretty good luck with this site) and this week I am running a ContentMo Kindle Unlimited campaign. Then in April I will have a free promo again. This is all part of my new strategy to pull the cord a little more regularly. I know part of it is that I only have two books and a novella out. (The first full novel was released in four parts.) But I still ought to put more into promotion. So my plan now is to do one paid promo every other month, and on the opposing month, do a free promo. So far, I haven’t gotten much out of my promos. I got 14 sales out of my BargainBooksy ad, and no page reads yet from ContentMo. 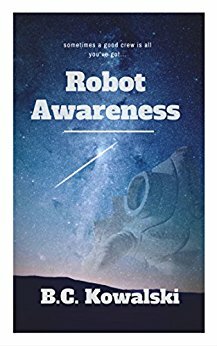 My BargainBooksy ad put Robot Awareness in the top 35,000 (of more than a million) ebooks on Kindle, and in the top 500 for its categories. Not a bad start. I’ve had really good luck with FreeBooksy for promo – though it’s more expensive, it also got the most downloads and led to a pretty sizable sales bump in the weeks that followed. Both of these are still ROI negative. I admit that makes it hard to talk myself into writing sometimes, since I have paid work I can be doing. But I’m operating on faith that the more work I put out there, the more my sales will improve. My last release had the best pre-order yet, and I’m hoping the next one is even better. I’ll keep you guys updated on how the ContentMo and free promo go! Like this post? Follow me on Twitter, Facebook, or Instagram. Check out my books here.